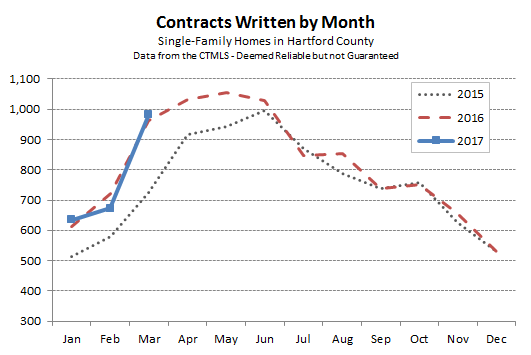 Hartford County finished March with 984 single-family contracts, a 2.3% increase over March of 2016. The slight outperformance brought the year-to-date contract total to within one deal of the first quarter of 2016. The market continues to be very active, with strong demand from buyers. The County-wide market is on the verge of being a seller’s market, which is traditionally defined as having less than 3 months of inventory. In general, sellers have an advantage at low price points and buyers have an advantage at high price points. However, people actually in the market looking to buy or sell need to look closely into the dynamics of the individual towns, price points, or both, to get a true picture of their situation. The count of active listings for this time of year is down compared to recent years. The MLS reported 2,471 active single-family homes in Hartford County when I downloaded data a few days ago. Last year at this time there were 3,178. There were 3,188 in 2015. Since the number of deals is virtually identical to last year, but the number of active listings is about 22% lower, it seems safe to conclude that the “problem” is on the supply side. Meaningfully fewer owners have listed their property for sale this spring, limiting the supply of available homes. Too few listings is a great problem for property owners. It gives people thinking about a move some comfort that there will be buyers interested in their home. Hopefully the favorable dynamics will allow them to sell for a good price. We’ve been telling our seller clients to consider getting their home onto the market sooner rather than later. If you’re considering a sale, we would love to have a chance to interview for your listing and provide a more in-depth analysis about your situation. Feel free to reach out to us at any point. Finally, I should note that the table showing the number of contracts by town has been updated to include the year-to-date totals. 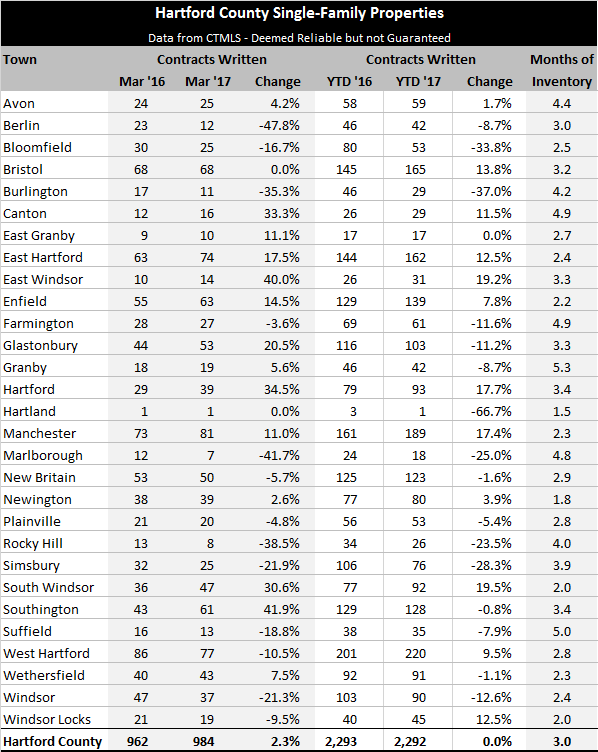 Monthly results can be quite volatile, especially for the smaller towns. Adding the deal total over a longer time period should give a better sense of what is happening in each town’s market.